The Most Complete, Affordable & Flexible Life Coach Training & Certification. All the Tools and Skills You’ll Need to be an Effective Life Coach! Plus, a Free Marketing Course to get your life coach business started! Accredited Life Coach Certification Online with a Convenient & Flexible, Self-Paced Schedule! Work entirely online, when it’s convenient for you – make your own schedule! 25+ Small Group Training Sessions per week to participate in! Work directly with your trainers in our virtual classrooms! Build World-Class Skills Beyond Traditional Life Coaching! Our Life Coach Training & Certification is presented through the 5 Phases of a Coaching Session. You’ll learn each of the life coaching and NLP skills in a systematic way which mirrors the life coaching process successful coaches use. In the iNLP Center life coach certification online, you’ll learn about the five phases of a coaching session: Pre-Coaching, Information Gathering, Transformation, Integration, and Wrap-Up/Homework, you will learn the key NLP tools, models, and techniques that are most effective in each phase. For our life coach certification, we have created the iNLP Universal Coaching Model™ that assists you through each phase of the coaching session, so you know what to do and when to do it. With the help of our Coach-Go™ and Coach-Do™ worksheets, you will be able to confidently move your client from obstacle, to action, to goal. Throughout your online training, you’ll be practicing these tools in your offline assignments and during your small-group virtual training sessions. With over 20 live sessions per week, you’ll have ample opportunity to discuss what you’re learning, practice techiques, and get one-to-one feeback from your trainers and other students. When a live session fits your schedule, you’ll just click a button to pop into the classroom. It’s that easy and that convenient! Over 50 NLP and life coaching techniques to use with clients, all organized in a common-sense, accessible way. A simple-to-use coaching system for working effectively with clients. Knowledge and experience putting the iNLP Center coaching system in practice, just like you will as a professional life coach. Three professional and accredited life coaching certifications to hang on your wall! A business and marketing plan with a step-by-step guide for success! Online course with unlimited live sessions! held in our virtual classrooms. *Minimum virtual live session attendance requirement is 18. To earn all 60 ICF ACSTH credit hours, you must attend at least 48 total virtual training sessions (included). Not sure which to choose? Want to learn more about ICF? Call (951) 428-4264 or Click the “Questions?” box below. The first module of your Life Coach Certification Online Training is where your vision begins. We’ll take you step-by-step through the elements that go into creating your coaching vision – your business goals, your coaching niche, how much you should charge, and even what you’re most worried about. After that, you’ll have a private life coach training session with iNLP Center founder, Mike Bundrant, to review your coaching vision. He’ll help you clarify your vision and develop a plan of action to work on during your life coach training and clear direction after completion. Plus, to keep a record of your plan, he’ll send you a personalized e-journal to track your progress towards your vision! Unit 3 What is Life Coaching? Nothing affects behavior as much as a mindset. Sometimes you can change your mindset and feelings as an act of will. Other states of mind are difficult to change. In this life coach certification online training, you will learn to change those mindsets that don’t budge on their own. The coaching mindset is fundamental. It’s not as much coaching technique, but the states of mind coaches need to be in while coaching. In our life coach training, the Coaching Mindset is broken down into three sections – 1. Confidence-building facts about life coaching and the life coaching process that most new coaches don’t understand, 2. Accessing specific states of excellence while coaching to perform better. and 3. Learning specific coach beliefs to feel more confident and draw more potential for your clients. One of the biggest questions new life coaches have is, “What do I do in a session with clients?” Many life coach certification online courses teach about coaching, but not how to actually coach real people. The iNLP Center life coach training is different. In this module of your life coach certification online, you’ll be introduced to the iNLP Center Universal Life Coaching model. This unique coaching system eliminates the mystery behind effective coaching by revealing the Five Phases of a Coaching Session. From the moment a client walks in the door or appears on your screen, the Five Phases are in play. For a coach, every moment is an opportunity to move the coaching ahead and help the client achieve what he came for. You’ll learn specifically how effective life coaching sessions work and a powerful, step-by-step system for doing them yourself. Additionally, when you discover the real purpose of a life coaching session, you’ll be more clear and focused than ever. Unit 1 What is a Life Coaching Session? Certain things need to happen before great coaching can begin and they happen in the Pre-Coaching phase. During this life coach training module, you’ll learn specifically what clients need when they arrive at a coaching appointment so that they feel comfortable and ready to proceed. If you miss this one, the entire coaching session will be compromised. Pre-Coaching is also when you must begin the rapport and trust-building process. To create a deep connection with your clients, you need to move beyond verbal rapport to establish a powerful, non-verbal connection. In this module, you’ll learn how to read your clients’ non-verbal communication and tap into a deeper connection with them. Unit 1 What is the Pre-Coaching Phase? Getting the right information from clients is the difference between powerful coaching and mere conversation. The best life coach training shows you how to understand clients in a way that naturally reveals solutions to what holds them back. If you want to become a world-class life coach, you’ll learn to ask the right questions at the right time, providing a-ha moments and a surge of motivation to your clients. Done well, quality information gathering will reveal the specific goal for any life coaching session, as well as what needs to be done to get there. It’s like rising above a maze and suddenly seeing the path out. In this module, you’ll receive the iNLP Center’s proprietary life coach training model: the Coach-Go model, which serves as your guide for gathering exquisite information without getting lost in the process. A coaching model is like the map in a GPS system. Once you set a goal destination, the map shows you how to get there. A good map will also warn you of traffic jams and help you plan the trip. Without a map, how will you get to a new destination? Life coach certification is the process of learning to use coaching maps to guide clients toward their goals. It’s important to understand that life coaching can’t happen without coaching models. Coaching conversations are not aimless social interactions. They are intended to go in a positive direction toward a new destination for the client. As a coach, you need to provide maps that your client doesn’t have. iNLP Center coaching models are simple enough to learn quickly, yet cover a broad, relevant territory. Unit 1 What are Coaching Models? Like coaching models, communication models are maps that show you how to direct communication toward a positive outcome. Given how complex communication can be, you need models to guide you. Imagine a vast field of flowers. There are red, purple, yellow, pink, white, and many other colors mixed together. Your job is to find gather a bouquet for someone special, but you have no idea of the occasion or what this person likes. What will you do? You’ll pick some flowers and hope for the best! But what if you were told in advance specifically which colors to include and which ones to avoid. Imagine being shown a picture of the right flowers to gather. How much simpler would that be? Life coaching isn’t so simple that it can read from a predetermined script, but it also doesn’t have to be complicated. As you listen to clients speak, what if you could instantly recognize the most valuable information? Good life coach certification gives you the communication skills that paint a clear picture of the most important questions to ask, even though a client may present a variety of information. Unit 1 What are Communication Models? Unit 40 YAY! Request Your NLP Practitioner Certificate! If you’ve gathered good information about the client’s goal and what gets in the way, you should have a toolbox of techniques for overcoming those obstacles. The transformation phase of life coaching. Techniques aren’t everything, but the right technique at the right time works wonders to move clients ahead. In the Transformation Phase of your life coach training, you’ll learn the optimal conditions for facilitating change, as well as the most influential kinds of change you can achieve inside a coaching session. For the personal growth enthusiast, learning the methods in this module is like opening a present and gazing in awe at the gift you’ve always wanted. The NLP tools here are the hidden structure behind every thought and feeling you can have. And these maps of the mind are not taught anywhere but in NLP coach training. Knowing how your inner life works, specifically, gives you the keys to change. Wanting something is never enough; you also need to be empowered and have an effective strategy for success. You can build inner resources by learning strategies –mental building blocks and formulas – to create any result on the inside before producing it in the world. Don’t settle for a life coach certification online that gives you less than the best tools to empower your clients. Clients want results. If you have the tools to help them turn bad decision-making around, motivate themselves effortlessly, and create states of excellence whenever they need, you’ll deliver those results. Life coach training without a focus on goal-setting isn’t life coach training at all! Life coaching students should learn how to harness all your resources, anticipate obstacles, and look at goals through a holistic lens. At the iNLP Center, we take things a step further by giving you the NLP methods that put the entire past and future in perspective. This will give you the opportunity to move beyond past programming and set yourself up for a bright future. The ability to help some get unstuck and moving forward in life is the signature of a skilled life coach. The iNLP Center life coach certification online will give you the tools to do this consistently. Helping people get unstuck is not the gift of a few lucky people. It’s a skill set that can be learned. By the end of this module, you’ll know some of the best techniques ever developed to transform negative states and habitual behaviors, making them a non-issue for your clients. All the mindset shifts in the world mean little if they don’t translate into new behavior in real life. The most important part of any coaching cycle is the actions the client takes between sessions. For coaching to make a real difference, this is a must. How do we get there? For our life coach certification online training, the iNLP Center has developed the Coach-Do model, a proprietary method that shows you how to help clients take action on the insights and newfound motivation that arises in coaching sessions. You’ll learn how to positive expectations with clients and give customized homework assignments that they will be excited to do. This is the work of integration, a skill set every life coach must have! As a session wraps up, some of the most important coaching can happen if you know how to leverage the power of homework. There are three kinds of homework you can give your clients so they continue making progress between sessions. It’s important to understand the purpose of each and match that purpose to your client’s needs. Do this well and your clientele will grow like never before. This is where we complete your life coach certification online course with a thorough review of the coaching skills you’ve learned. During the course, you will have been practicing your skills with other students and volunteers and here is where it all comes together. In our coaching simulation exercises, you’ll have a no-risk way to share with other students are trainers what you’d do in common coaching situations. You’ll also learn what other students and your trainer would do, expanding your perspective and skill. Through simulations, role plays and real coaching with others, you’ll begin to feel a coaching confidence that will propel you forward into success as a life coach! Unit 6 Triple YAY! Request your Certified Life Coach Certificate! The other model included in this module is Criteria for Psychological Safety. Emotional safety is primal. If we do not find a way to feel safe each and every day, we cannot accomplish much beyond reacting to the vague yet constant threat. Most of our life is geared towards reducing anxiety and getting to a place where we feel safe. If it were possible to suddenly destroy your every psychological defense mechanism and wildly expand your boundaries to include all sorts of unfamiliar experiences, you’d experience an incredible rush of panic. A quest for inner peace, as well as personal development, should honor the need for emotional safety. You are wired for personal safety and your personal development plan needs to be equally wired! Learn how to recognize your criteria for personal safety to achieve your goals in a more effective way. What is ICF accreditation and do I really need it? ICF (International Coach Federation) is a professional organization for life coaches. Many life coaches think of ICF as the “gold standard” for coach trainings. If ICF has accredited a training, it says the training covers the needed core-competencies a life coach should have. For a life coach to become an ICF Associate Certified Coach (ACC), they must earn 60 ICF-approved training hours, log 100 practice hours, pass a performance review demonstration, take an intensive online test, and get 10 hours of coaching from an ICF-accredited mentor. It is quite a bit to earn all of these things. However, ICF wants to make sure that if they accredit a life coach, that coach will have the right skills and training neccessary to help others. ICF also has 3 levels of accreditation – ACC, PCC, MCC. ACC is the one you earn first. Our Life Coach Training is designed around preparing you for the ACC level accrediation. You can earn the required 60 hours during this training. To earn the full 60 hours, you will need to attend at least 48 live sessions (included with your enrollment) and successfully complete the training. 1. Our NLP Integrated Life Coach Training includes the 60 ICF-approved training hours, your performance reviews, and the opportunity to start logging many hours. However, you will still need to get your 10 hours of ICF Mentor coaching and study for your ICF Assessment online test. 2. Our ACC Package gives you everything you’ll need to apply for your ACC. It includes everything in our NLP Integrated Life Coach Training, plus your required ICF Mentor coaching, guaranteed 100 practice hours, ICF Assessment Prep, and coaching supervision during and after you training. The big questions is…Do I really need ICF accrediation? Technically, Life Coaching is an unregulated field. This means that anyone can call themselves, and practice, as a life coach. Because of this, no accreditation is required to practice as a life coach. However… when Life Coaching does become regulated, ICF will most likely be the organization that will be in charge of that. Many other life coach accrediting organization already recognize trainings if they are ICF accredited (such as BCC). As well, many companies require their coaches to be ICF accredited or have taken an ICF-accredited training. So, the answer is, it is better to be safe than sorry. You don’t know where your path will lead and so it is best to be prepared with the training and accreditation that will give you the most opportunity. Immediately upon enrollment, you can begin working on your course! As soon as you enroll, you’ll have access to your Student Dashboard. You can start your course anytime you like and take as long as you need to complete it. Just click on the first Life Coach Training unit to start learning! As you work through your training, you will have fun and interesting offline activites as well as access to our virtual training sessions where you’ll work directly with our trainers and fellow students on coaching application and techniques! Most people try to understand others by listening to their words, but there is so much more! If you want uncommon insight into people, you’ll learn to interpret non-verbal communication. Then you’ll be in a rare class of people who get paid to offer insights and direction. Create rapport and trust based on the right cues from clients. Discover new and important growth opportunities for clients. “Read” others and know how to help without getting lost. There is an undiscovered world of structure within your mind. This inner construct is so important that it should be taught in primary school, not life coach training. Inner dynamics aren’t taught in the mainstream, so when you see the hidden design behind your inner life, you’ll be prepared to help people like never before. Can you imagine taking a life coach training that does not teach specific skills to help you influence your clients toward change? Clients pay to be influenced in a positive direction. How can you influence them with integrity and respect? A single, powerful question can change the direction of a life coaching session and place a client firmly on the path to success. No life coach training or certification course should be without powerful language tools. You need to discover what’s behind the words and open client’s minds to new possibilities. Wanting something is never enough, you also need an effective strategy to get there. Making solid decisions and motivating yourself under any circumstance is a matter of strategy. Learn inner strategies – the mental building blocks and formulas – to produce any result on the inside before creating it in the world. Relationships form the basis of our daily lives, but do you know how to optimize them? Learn the three ‘perceptual positions’ that can be used to resolve relationship problems just by experiencing them. A life coach certification online training without a focus on goal-setting isn’t life coach training at all! Learn how to harness all your resources, anticipate obstacles, and look at goals through a holistic lens. Get specifically what you want from your life! Being stuck is caused by the meaning we make out of any situation. When you can change the meaning you make, you can free yourself. In this module, you’ll learn how to reframe any situation to get unstuck. Knowing how to build rapport with your client is a key to not only coaching them but turning a coaching inquiry into a paying client. Gaining rapport and the trust of your clients aren’t limited to just verbal skills. There’s a whole level of subconscious common ground you need to have. This gives your clients that gut feeling that they can trust you. If you’re trustworthy, you should make it fast and easy for your clients to know it. The past and the future are organized in our minds. For most people, time is structured unconsciously, so they don’t know how to intentionally learn from the past and stay motivated toward a bright future. Successful people know how to capture the best of past experiences, focus on the future see the big picture as well. How you think about life determines the results you get. Once you enroll, you will be given access to your Student Dashboard. 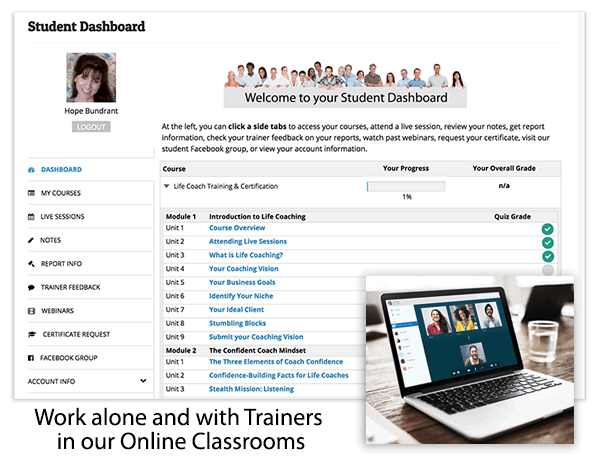 Your Student Dashboard has links to your course, live sessions, internal messaging system, our student Facebook group, and all your account information. Everything you will need to work on your course is right there. The first thing you will do once you enroll in your life coach certification online is either attend a New Student Orientation or watch our Getting Started Videos. Each of these will teach you how to use our learning platform. However, most people are able to get started with the life coach certification online immediately because our platform is intuitive and user-friendly. Working on your course is simple! As soon as you enroll, you can access your training materials from your course list in your Student Dashboard. Just click on the first unit the list to get started. Each unit will direct you to the next unit. It’s very easy to follow. When you are ready to attend a live session, simply find a time in our Live Sessions Calendar that’s convenient for you, then click the link to enter the virtual classroom. Your trainer and other students will be there ready to work with you! What are the Live Training Sessions? Our live life coach training sessions are an opportunity for you to work directly with our trainers and other students, practicing your new tools and going deeper into the coaching application. Our life coach certification online live sessions are held in our virtual classroom with audio and video, allowing you to interact in real time. We offer over 20 sessions per week that you can attend throughout your Life Coach Certification Online Training. You are not required to commit to the same time each week, instead, you are able to drop into a session when it’s convenient for you. You are welcome to attend as many live sessions as you like. If you are enrolled in our NLP Integrated Life Coach Training, you are only required to attend 18 live sessions to receive your life coach certification. However, you may attend as many as you like. By attending the required 18 sessions, you will earn 30 total ICF hours when you successfully complete the course. If you would like to earn more ICF hours, you will receive 1 hour per additional live session you attend (max 60 total hours awarded). Live Sessions are available 5 days per week throughout the day and night- to accomodate all timezones. You may attend live sessions as they fit into your schedule. What accreditations will I receive? All our courses are accredited by the International NLP Association (INA). Our Life Coach Certification Online Training is accredited by the International Association of Professional Life Coaches and International Coach Federation. You can receive up to 60 ICF training hours which meets the education requirements for your ACC. • Earn up to 60 hours of Coach-Specific Training. The Association of Coach Training Organizations (ACTO). How do I earn Coach Experience Hours? The assignments in our courses provide you the opportunity to practice what you are learning with other students. When you complete the assignment with another student, you can record that as a reciprocal coaching hour. According to ICF, reciprocal coaching hours count as “paid” hours and can be used toward your 75 paid Coach Experience Hours. Any assignments you do with friends or family can count towards your 25 pro-bono hours. 100 hours in total are required to apply for your ACC. Additionally, our students practice coaching regularly with one another. You will be able to connect with one another to earn even more hours. You’ll have a log in your Student Dashboard to track your hours. What are ICF Coach Mentor hours? To earn your ACC with ICF, you must also have 10 Coach Mentor Hours. You can earn those with us by enrolling on ACC Package option our ICF Mentor Program. It includes 7 small group sessions and 3 individual sessions. The sessions are held in our online classrooms. Tips for your ICF Performance Evaluation submission. Can I enroll in the NLP Combo, then later upgrade to the Life Coach Training? Our Life Coach Certification Online has all the NLP Practitioner and Master Practitioner tools integrated into the context of a coaching session. So, you will learn what tools to use when and why. Some NLP tools and models are for information gathering, some are for transformation, and some are used for integration. This is a much more efficient and intuitive way of learning NLP so that you can successfully integrate it into your coaching practice. To get the best Life Coach Certification Online Training experience, enroll in the Life Coach Certification Online up front. You will learn the same NLP material as in the NLP Practitioner and Master trainings, but you will benefit from understanding the purpose of each tool in the cycle of a coaching session. Will I learn just as much NLP in the Life Coach Training as the NLP Combo? 90% of the content is exactly the same but is organized into the phases of a coaching session – such as “information gathering tools”, “transformation tools”, “integration tools”, etc. In our life coach certification online, you are able to know not just how to use the NLP tools you are learning, but when to use them. This is often a confusion for students studying NLP and then trying to apply it to coaching. If you plan to be a coach, it is more effective to learn NLP in the context of using it in coaching. Both the NLP Practitioner, Master, and Life Coach Certification Online use the same units for the NLP portions of the training, so the depth of NLP is the same for the courses. However, the Life Coach Certification Online adds in our Universal Coaching Models which arranges the order in which you learn the NLP tools. What you might learn in the NLP Master training, you may learn sooner in the Life Coach Training. The NLP tools/models in the Life Coach Certification Online modules are organized by their purpose within the 5 Phases of a Coaching Session. If the NLP tool/model is an information gathering tool, it will be listed as a unit in an Information Gathering Phase module, etc. There are many units within the module of the specific phases. In the NLP Practitioner and Master training, the modules are arranged only per tool. So, there are more modules, but fewer units per module, as that module is, most often, only covering one tool/model. Why should I get life coach training with iNLP Center? “For over 18 years I have made six figures annually as a life coach. I am willing and well qualified to show you what to do. As a certified life coach, you can work from home or an office. You can even work exclusively online via Skype or any other platform. You can do individual coaching, group coaching, or email coaching. You can also develop personal growth programs to sell online. The sky is the limit! We give you the tools and help you on your path. Who is the trainer for the online life coach training course? Mike Bundrant (co-founder of iNLP Center, Master NLP Trainer, and retired psychotherapist) is your master life coach training director. Adam Defoe is a live session trainer in charge of grading and student feedback in the iNLP Center life coach certification online program. Hope Bundrant oversees your credentialing process, if applicable. The Life Coach Certification Online is a self-paced, accredited life coach training course that takes around 200 hours to complete. You can choose to work when it’s convenient for you. You can also choose to attend the live sessions when it’s convenient for you as long as you attend the required amount by the end of your training. There is no time limit for completion of your life coach training. You have lifetime access to all of your life coach certification online materials. If you have questions about our Life Coach Certification Online Training beyond what’s listed above, please visit our FAQ’s page, online chat us, or call (951) 428-4264.